The Sinai Trail is a 100% Bedouin-run community project. When the Sinai Trail was first launched in 2015, the trail was a 220km route, taking 12 days to complete, involving three Bedouin tribes: the Tarabin, Muzeina and Jebeleya. Today, it has grown into a 550km route, taking 52 days to finish, and involving five more Bedouin tribes: the Awlad Said, Garasha, Sowalha, Hamada and Alegat. Today, altogether, there are eight Bedouin tribes involved in the Sinai Trail. Each tribe manages the particular part of the trail in its own land. Every tribe guides hikers across its lands to the borders of the next tribe. All decisions about the trail and its future development are made by local Bedouin tribes. The tribes of South Sinai have long existed in an alliance called the Towarah and it is over 100 years since all these tribes collaborated on a travelling route in the way they do today on the Sinai Trail. 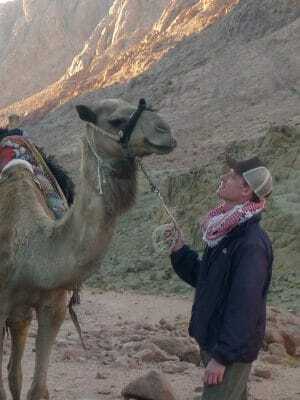 The Sinai Trail is reviving old paths, alliances, and history. The Bedouin cooperative is supported by a wider Sinai Trail Team, including men and women from across mainland Egypt and Europe, who add extra skills and strengthen the project in key areas. Faraj grew up in the highlands of St Katherine and belongs to a tribe known as the Jebeleya: the Mountain People. 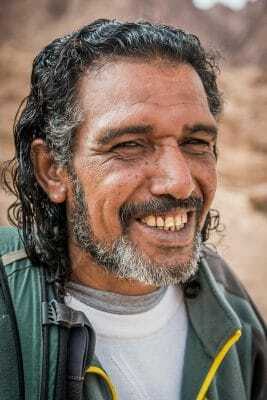 One of the Sinai’s most respected outdoorsmen, what he doesn’t know about hiking probably isn’t worth knowing! He is a consultant for several NGOs, he organises research programmes for the University of Nottingham, and he helped fix the BBC documentary The Frankincense Trail.